We equip our shoes with the most innovative and groundbreaking technologies ever seen in the safety footwear industry. Our shoes feature protective toe caps, the strongest and lightest anti-penetration layers on the market, exceptional slip resistance, Electrostatic Dissipating soles (ESD), shock and moisture absorbing insoles with a cooling effect, super light and flexible midsoles, highly comfortable outsoles, waterproof and breathable uppers, Multi Dot Direct Massage System and a wide Scandinavian fit… Just to name a few. AIRTOX Industries A/S is a breakthrough brand of safety footwear straight out of Denmark. We build safety shoes with exceptional quality and comfort, while still being stylish and fashionable to wear them around. At present, AIRTOX products are sold exclusively in selected stores around Europe. Our goal is to expand our global footprint and make our products available in more countries in the near future so more people can enjoy great safety shoes from Denmark. Currently, we focus on developing and manufacturing the safety footwear and selling our products worldwide in large quantities B2B. In addition, to ensure the ongoing support of local businesses, at AIRTOX, we also collaborate with small and family driven companies, whom we work intensively with to build successful and long lasting relationships. Someting we are immensely appreciative of. The icon of the AIRTOX brand is a characteristic, slightly predatory bird. What is its origin? What does it mean? And what does it have to do with the future of safety shoes? AIRTOX birds come to Earth from a distant planet outside the Solar System. They are highly clever, mechanical beings with advanced intelligence. Recently, they came to Earth and – for an unknown reason, in giant factories they have started to create shoes with special properties, never before seen in the footwear industry. They share these truly revolutionary products with humans. You can’t be sure when you meet them because their communication with humanity takes different forms. Ironically, one of the most concentrated nests of AIRTOX birds is in the Copenhagen Airport. From there they travel huge distances, mainly in flocks, to spread their population worldwide. We do not know much about them, but what we do know is that the AIRTOX birds are unpredictable, develop fast, and are far more technologically advanced than anything on Earth. The knowledge and technology they share with us – humans, and make our life more comfortable, stylish and safe. The purpose of the story, is to create an illusion of this bird who is taking over the control of the AIRTOX R&D division with a mission of bringing the newest technologies to Earth. Making us capable of creating the most sophisticated, ultra comfortable shoes stuffed with all the fanciest and almost out of this world technologies brought by the birds from the intergalactic hemisphere. AIRTOX headquarters are based in Denmark. From here, all design, development and research is carried out. We have dedicated a huge amount of time and resources to researching technologies, and testing materials, components and new systems. 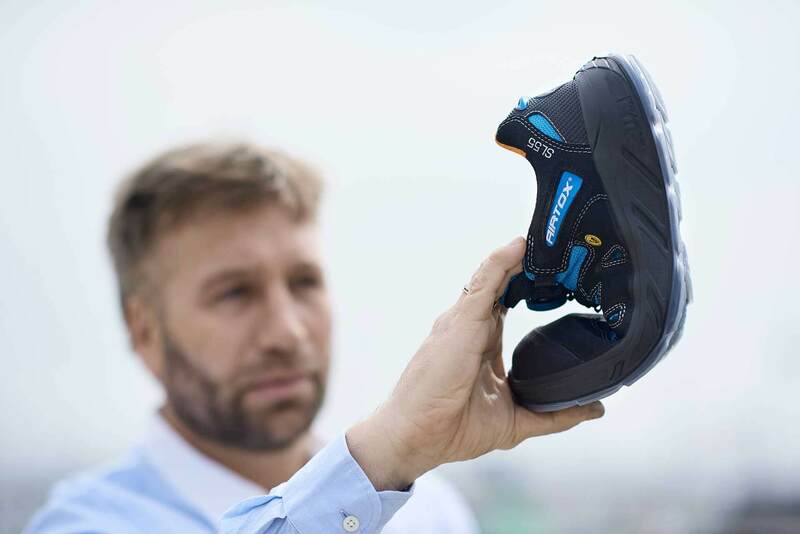 Our R&D team has a +20 years of experience in a safety footwear and keeps track of the whole development process, from the first design stroke to the final product. We guarantee the reliability and durability of all products. Unlike a large portion of our competitors, we don’t make compromises. Our priority is the satisfaction of our customers. Currently there are five technologies that are available in the AIRTOX selections of shoes, Aqua-Cell®, WHITELAYER®, UTURN®, Cool&Me® and POWERBREEZE®. These technologies have been carefully engineered by our trusted professional partner, European Tech Group. At AIRTOX we are proactive in developing and investigating new trends in the safety footwear industry. We aim to remain innovative and at the forefront of the industry. 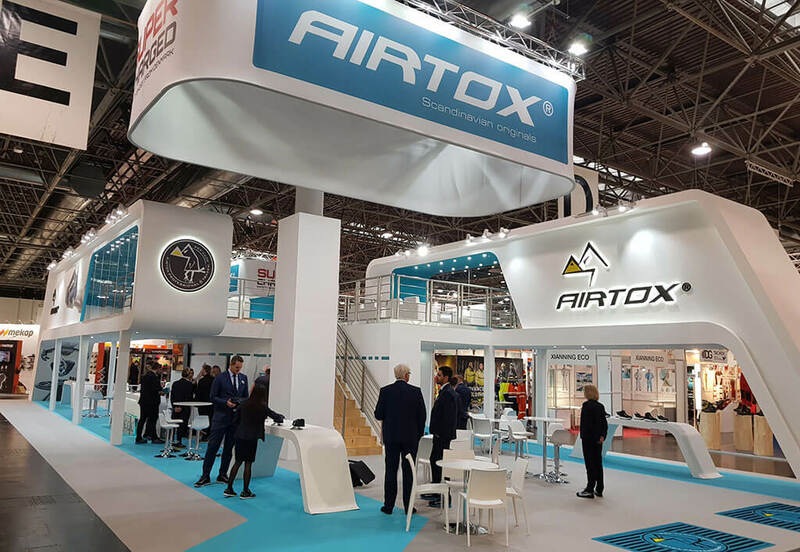 New technologies not yet implemented in AIRTOX products are tested, and the benefits of their introduction discussed to ensure that AIRTOX ultra lightweight safety shoes are the most advanced on the market. Our vision is to become the most unique and innovative brand in the sector of industrial safety. To obtain this vision, we are currently on a mission of utilizing the knowledge and inspiration from global cultures. We do it by collaborating with people and companies across the world and building a multi-national environment at our workplace. This helps us to gather our ideas together and build outstanding, well-thought-through products. During our work we focus on social responsibilities and great working conditions to make sure that motivation and dedication of every single colleague in sky high. We care about the protection of our environment and make sure that both – ourselves and all our suppliers, are committed to follow international and local environmental laws. We thrive on offering our employees the best working conditions. We believe it to be of significant importance to generate a comfortable working space to ensure our employees perform an active part in the positive development of our company. Therefore we have an open, non-discriminatory approach to our staff and collaborators and ensure that diversity and self-development are supported. We follow a global Code of Conduct, consisting of several fundamental principles on ethical and responsible behavior on a worldwide basis. For all our collaborating suppliers we guarantee the following: all employment relationships will comply with basic needs according to the UN conventions. We always seek for new talents to contribute to our team. If you are brave enough to work in our fun, fast and innovative environment, apply and tell us about yourself! As a family driven company based in Denmark, we proudly participate in the local community and support various activities with sponsorships to sports, institutions and schools. If you are soon to be finished with your Master or Bachelor studies in Denmark, we will be glad to offer you a Master or Bachelor thesis project. Write to us and let’s discuss if we can help you!